Well, I know that you all have been screaming for a post from me, and as I was looking for past ideas, I stumbled onto this post which, well, never quite made it, so here you go! I'll get another post to you later. Near the end of our thousand-plus kilometer venture, we found this small town, Pierrefonds. Pierrefonds is a small town located approximately NW of Paris by about 60-70 kilometers (35-40 miles). Overall our stay there was thoroughly enjoyable, we stayed at a "2-star hotel" but it felt more like a 4-star with the perfect view of the castle and surrounding country, a full size bathroom, and a location in central Pierrefonds. You may of noticed that I mentioned castle... well Pierrefonds has the biggest and most complete castle that I have ever seen. It features eight towers, a grand hall, chapel, an amazing crypt, along with the ability to go through the entire castle just by yourself, on a self guided tour. Frankly I find this amazing. In America it would probably be quarantined and "preserved," basically cut off from the people. Another reason that I find Pierrefonds so wonderful though is that it is so well kept. Flowers on the tables, lawn cut, and all the stones perfect and polished. It really is something else. My experience was that the whole castle was incredibly surreal, and I found it intriguing to imagine a cart being hauled up the path by a donkey, traders calling their wares. The entire experience is amazing, right from it's origins. In fact, Pierrefonds was originally built by Louis of Valois (the Duke of Orleans) and King Charles VI, in the late 1300's. But it was demolished two centuries later. The ruins sat there for centuries until they attracted the noice of Napoleon III, in the 1850's, who had it rebuilt by Viollet-le-Duc in the medieval style. Initially they were actually only going to work on the keep (central fortress in the castle) and leave the rest in ruins, but over time they modified the plans to finish the castle. Pierrefonds was completed in 1884, finished but unfurnished because of the war of 1870. It still only has a few benches and chairs. 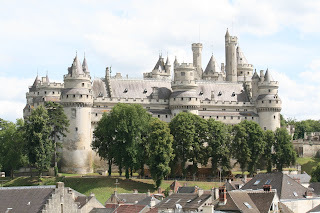 For me Pierrefonds was one of my favorite cities, and I will try to go again someday in my future. I could spend a good amount of time at this nice, historic, and quaint town, which is not only off the tourist tack, but overflowing with history. Hey Antonio! I like that.